Having worked on the topic of M2M value chain structures in 2012, a couple of relevant market developments caught my attention over the past few weeks. These involve: Aeris, an M2M service provider, Cisco, and Deutsche Telekom. Each of these company initiatives aims to simplify the process of implementing M2M and IoT applications. They provide guidance to (non-technical) companies that are seeking to implement M2M solutions while also providing an organising structure for complex application situations. These examples hold lessons that companies can apply to improve their sales performance in M2M and IoT markets. The first initiative involves Aeris which launched Neo, an open and transparent online marketplace for IoT and M2M connectivity. According to its promotional information , Aeris aims to help prospective customers to purchase a connectivity solution in minutes, and have a fully functional solution within a day. By optimizing this aspect of its business model, Aeris is lowering the adoption barrier for start-ups and developers that want to begin with small volumes (and who might not receive sufficient sales attention from the larger M2M service providers). The second eye-catching initiative was Deutsche Telekom’s (DT) launch of a partner program . DT appears to have taken its Marketplace concept, launched in May 2012, and formalised it into a partner program that aims to leverage economies of scope. M2M offerings from approved M2M solution providers in a given DT market can now gain access to many other markets across the DT geographic footprint. In addition, some of the uncertainty for buyers has been removed by leveraging the DT brand along with marketing- and technical-support as well access to DT’s distribution channels. The third such initiative applies to Cisco which is in the process of launching  three partner specializations focusing on IoT applications. These are targeted at IT solution providers with the aim of expanding their knowledge of operational technologies and specific vertical market issues. The specializations are the Advanced IoT Connected Safety and Security specialization (physical security comprising video surveillance, access control and associated analytics); the Advanced IoT Manufacturing specialization; and the Advanced IoT Industry Expert specialization (to help specialist, operational technology companies to become competency with Cisco solutions which can then be included in their go-to-market offerings). These three examples characterize one aspect of business model innovation which is to speed the path-way of companies implementing M2M/IoT solutions along the M2M sales pipeline. Historically, the implementation challenge facing companies required them to identify and select companies along the M2M value chain in order to design, deploy and support their applications. If the implementation stages along the value chain are organized into a meaningful structure or process then this burden is significantly lessened. The fact that these developments have taken a couple of years to materialize should be instructive to other companies in the connected devices eco-system, especially as it relates to the IoT. It’s one thing to re-brand existing capabilities as being M2M or IoT ready but the practical delivery of commercially viable services and solutions via suitably well-crafted business models takes time. Time, however, might not be on the side of industry incumbents. Consider the case of Telefónica which recently launched ‘Thinking Things’ . This is an IoT product that users can set up at home or in their offices to connect almost any device to the Internet without the need for any programming knowledge or additional infrastructure. This is an interesting first step for a mobile operator and one that holds promise once Telefonica progresses beyond the hardware and into the realms of services that help users to put these capabilities into use i.e. user-friendly implementation tools and integration with Smartphone/Tablet devices for visualization, control and eventually monetisation of associated digital information. Based on a Twitter dialog  between former and current staff, Telefónica’s process took about three years. This is in contrast to SmartThings which is targeting the IoT opportunity in smart homes. The company was launched as a product concept in 2012 and acquired by Samsung for $200m within 2 years. 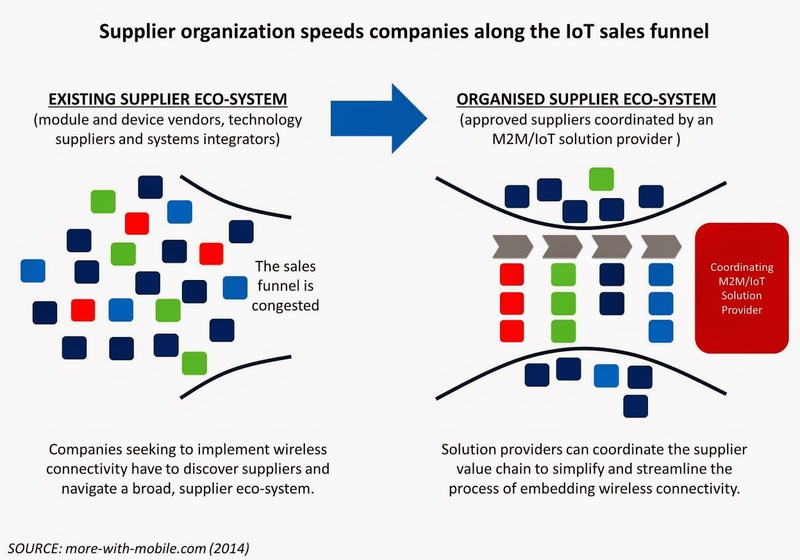 Such is today’s pace and scope for value creation in the IoT market.